Today I found out the Cincinnati Reds were once renamed the “Redlegs” due to the second “Red Scare”. The Cincinnati Reds name was originally inspired by a previously existing team, the Cincinnati Red Stockings, which was the first fully professional baseball team. This former team had ten men on salary for eight months to play baseball for the Red Stockings. It was organized by Harry Wright, who also played center field for the team and managed the defensive positioning, which was something that typically wasn’t done at that time. The Cincinnati Red Stockings were wildly successful early on, going 57-1 (wins-tie) in their first season while touring the United States. They followed this up by winning 24 straight games the next season before losing 8-7 in 11 innings to the Brooklyn Atlantics, which resulted in their attendance declining substantially and the team ultimately being disbanded, even though they only lost 6 games throughout that season. In any event, the present day Cincinnati Reds’ name was inspired by the Cincinnati Red Stockings, even though they have no real connection with the Red Stockings other than being from the same town and initially naming themselves the same thing (the Cincinnati Red Stockings). However, when this latter organization moved from the American Association to the National League, they shortened the name to just “Reds”. This name stuck until 1953 when the association of the term “Reds” with communism caused the Reds to change their name to the “Redlegs” in order to avoid the social stigma. Further, for a four year stretch from 1956-1960, the name “Reds” was removed from the team’s logo and no longer appeared on the team’s uniforms. Despite the continued use of the changed logo, the name “Cincinnati Reds” was restored after the 1958 season. If you’re wondering where the term “Redlegs” came from, this was once a derogatory term used to refer to a specific group of poor white people living on various islands in the Caribbean (generally originally from Ireland and Scotland). They were also commonly known as “white slaves”. Some were in fact actual white slaves, having been taken by press gangs and transported to Barbados to be sold. Others were simply indentured servants, agreeing to work more or less as slaves for a time in exchange for transportation. It’s estimated around 50,000 of these Redlegs were transported from Ireland alone during the mid-17th century. So, apparently, the Reds preferred to associate themselves with slavery, rather than communism. Although, this is marginally fitting given the reserve clause that was in place at the time, which forbid a player from being able to play for any team but the one who owned the rights to him when his last contract expired, unless he was released or traded. This resulted in teams getting to set salaries nearly as low as they pleased and to completely control the careers of their baseball players. The only real negotiating tactic the players had at their disposal was to refuse to play baseball at all, which resulted in them not getting paid anything when they didn’t play and obviously wasn’t a good tactic for players who weren’t stars. After the Cincinnati Red Stockings were disbanded as a professional club, Harry Wright was hired by Ivers Whitney Adams to organize a new professional club in Boston with the first professional league. In 1871, he put together the Boston Red Stockings, bringing over three of the members of the former Cincinnati Red Stockings. The Boston Red Stockings eventually became the Boston Braves, which are now the Atlanta Braves. The Boston Red Sox were not established until much later in 1901. 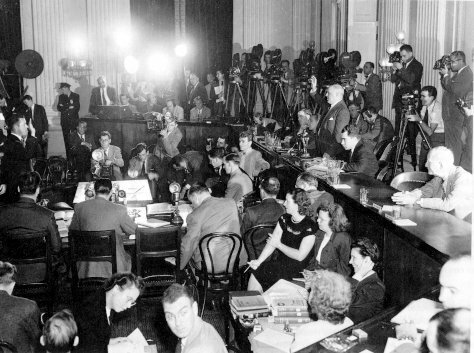 All members of the Hollywood Ten ended up being given one year prison sentences for contempt of Congress when the Supreme Court refused to hear their case. One of the ten, Edward Dmytryk, ultimately decided to give names and as a result, his prison sentence was shortened and he was removed from the blacklist. Ultimately the witch hunt continued after the Hollywood Ten and numerous other movie industry employees were blacklisted, including 84 of the 204 that signed a brief supporting the Hollywood Ten. Actor Larry Park was one of those blacklisted after he stated to the committee: “Don’t present me with the choice of either being in contempt of this committee and going to jail or forcing me to really crawl through the mud to be an informer. For what purpose? I don’t think it is a choice at all. I don’t think this is really sportsmanlike. I don’t think this is American. I don’t think this is American justice.” He did ultimately testify, but was added to the blacklist anyways. Further, anyone who used the Fifth Amendment to get out of naming names also was added to the blacklist. In the late 1950s, several people previously blacklisted began finding work in various places in Hollywood, such as Norman Lloyd in 1957, hired by Alfred Hitchcock. The major blow to the blacklist supporters came when Dalton Trumbo, one of the members of the original Hollywood Ten, was shown to be one of the writers of the movie Exodus. He was also announced to be one of the writers of Spartacus. The owner of RKO Pictures supposedly decided to get out of the movie business largely as a result of the Red Scare and the witch hunt it produced in Hollywood. What makes this notable is that this allowed Howard Hughes to get into the film industry when he purchased RKO Pictures. This subsequently resulted in Hughes playing a critical role in ending the Hollywood studio system that had been in place for a few decades. The First Red Scare occurred in the U.S. from 1919-1920 and was centered around socialist radicalism. The Second Red Scare ran for a decade around 1947-1957, give or take a few years. This was centered around communists supposedly infiltrating the U.S. and subtly manipulating national opinion and policy. In your Feb. 6, 2012 article about the Cincinnati “Redlegs” you include a factoid that says Frank Robinson’s rookie season was 1953. Baseball Almanac has his rookie year as 1956. The red’s could of been named after the union milita the redlegs, or perhaps it was just different terminolgy for red stockings. Marty Brennamen still uses the name redlegs on radio once in a while. I enjoyed your artlicle but until there is proof… it’s just a metaphor. I think Tim’s comment about the Union militia is probably closer to the truth. The link between poor Caribbean islanders and early baseball contracts is shaky at best. “Redlegs” was also a common nickname for artillerymen during the Civil War, referring to the red trim on their uniform pants. With the formation of the team in 1869, four years after the war, I think it’s likely that their name was a nod to Union veterans. There were also probably a few former soldiers on the roster who wanted to either make it a veterans’ club of sorts or use their veteran status to drum up support in the postwar north. Blacklisting and avoiding association with an ideology associated with over 100 million deaths is now laughable. Blacklisting and avoiding association with those opposed to redefining marriage is now cool. If there were a team known as the Hawaii Husbands, how long would it be before there was a demand to change the name to the spouses? Welcome to our brave new world. I’ve gotten used to the idea that the Correctomaniacs will use any excuse to drag out some reference to slavery, racism or sexism in order to paint the U.S. and its traditions in unfavorable colors, but this one is stretching it a bit. Does Daven Hiskey truly suppose that an American ball team’s name would be derived from a nickname for certain Caribbean islanders rather than from an American source, or was he simply hoping that no-one would bother to check up on his fiction? Or – did someone tell him that story and did he swallowed it without even a slight gag? Redlegs were a sort of paramilitary group, formed to combat the guerilla raiders from western Missouri, who were Southern sympathizers. What makes more sense – Kansas Red Legs or some Caribbean islanders who were probably quite unknown to the owners, managers and players of the Cincinnati team? Just another example of why I hate Political Correctness. The first time I heard that phrase, in the early eighties, it made my skin crawl. It gave me visions of Hitler’s Germany and Stalin’s Russia. I thought then and I still think that it is the most un-American phrase I ever heard come out of an American’s mouth. It implies that there is only one correct way to think – in other words, ‘goodbye, First Amendment’. The redlegs were guerilla union terrorists in the civil war. They killed innocents. Women and children. Go red legs! Kill those evil southern 5 year olds! Hooray!